Raimund Paetzmann, Director Real Estate heads EMEA Real Estate team and leads all expansion projects within Amazon’s Fulfillment, Transportation and Customer Service Network. Raimund is responsible for driving a Pan European approach, to ensure the Development is aligned and integrated with the Amazon.com global Initiatives. He his involved in the strategic network planning and he and his teams coordinate the search for all new EMEA location (Fulfillment Centers, transportation hubs and Customer Service Centers) and oversee all necessary negotiations with developers and Governmental bodies. 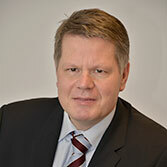 Raimund Paetzmann rejoined Amazon EU in 2005 (he was already in charge for Amazon.de between 1999 and 2002) and was a significant contributor to the design of the new generation of EU Fulfillment Centers. So far he has been in charge for searching and securing 27 FC’s totaling in more than 2,000,000 m² Warehouse space in Europe. 1,600,000 m² out of that were built to suit agreements. He and his team were also responsible for six Customer Service building projects cross Europe and Morocco. Prior to his work at Amazon EU, Paetzmann gained 2 ½ years experience as a Regional Manager for South Germany with Difa Deutsche Immobilien Funds AG (Union Investment). Paetzmann also brings an additional 5 years experience as a Managing Director of a middle sized project developer and property manager in Munich. Amazon v září spouští v Dobrovízi u Prahy nejmodernější distribuční centrum o rozloze 13 fotbalových hřišť. Toto centrum se zapojí do evropské logistické sítě Amazonu. Jaké jsou trendy v logistice a jak Amazon tyto trendy následuje a implementuje v každodenním provozu?